Hey there. Welcome to this weeks Read With Me. So what have you all been reading this week?? I was doing really well, reading one book a day, well that was until Friday when the hubby had his days off work. There were two posts that stood out for me last week. One contained a children's book review and the other and adult one. Redpeffer reviewed The Wolf Princess, this stood out for me as I felt my eldest daughter would really enjoy the book. Then Tattooed Mummy reviewed Elizabeth Is Missing, the cover of the book had me intrigued and the review that follwed had me more than interested. Onto this weeks link up. 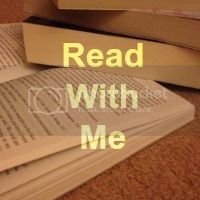 If you are new please take a look here at what Read With Me is all about. All you regulars get linking, commenting and if possible displaying my badge. Hi Chantelle! Thanks for the party! Have a good night. I have added my blog post on reading to babies I think its so important!